Claus-Dieter, Rainer, and I spent a few days climbing in the southern Monte Rosa group in the Wallis with the ridge traverse of Lyskamm as the highlight. After that we headed further west into the Dauphine where we climbed Barre des Ecrins. This is just my second summer in the Alps and therefore I haven't climbed in very many areas yet. So far I've been on a few mountains in the Eastern Alps. Last summer, Claus-Dieter and I spent a week climbing in the Western Alps (see the climbs of Jungfrau and Mont Blanc). So when we where thinking about what climbs to do this year I was pretty much open to everything. However, about 12 years ago, just after high school, I did a internship in the southern German town of Freiburg. One weekend, I took the train south into Switzerland all the way to Zermatt to see the famous Matterhorn. In Zermatt I took to the rack railway that leads to the top of the Gornergrat ridge where one is supposed to have a great view of the peaks of the Monte Rosa group, including the Matterhorn. Well, on that particular day I was standing up on the Gornergrat ridge in the middle of a whiteout and didn't see anything at all which was quite disappointing. So with that in mind I thought it would be a good idea to return to the area and to climb a few of the many 4000er peaks. Claus-Dieter was itching to return to the Monte Rosa too, since he had to bail on a climb of the Dufourspitze, the highest mountain of Switzerland, last year because of high winds. Rainer, who had been to the area many times, was game too. 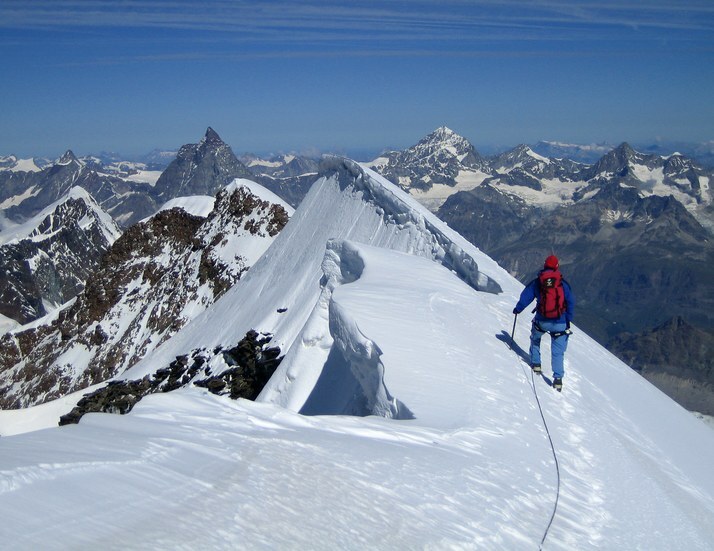 There were still a few mountains in the souther Monte Rosa group, like Lyskamm and Castor, that he hadn't climbed yet and he was eager to do so. So the following plan crystallized quickly: Drive to the south side of the Monte Rosa massive, because the approaches are shorter, the cable cars are cheaper, and there are fewer people compared with the approach from Zermatt. We would stay at the Refuge Gnifetti for two nights and do a few acclimatization climbs. Then we would climb to the top of the Signalkuppe where we would spend a night at the Refuge Regina Margherita, Europe's highest hut at 4554 m. This was something that Claus-Dieter and I though would be cool. As the highlight of the trip, we planned to climb the famous Lyskamm ridge traverse which is one of the great classic tours in the Alps. This promised to provide some challenges for us.